Over the years, many gardening wives' tales have been embraced as truths and guidelines. Some of these rumors can be harmless enough; however, others can be detrimental to your garden and your wallet. That being said, we've cracked some of these common gardening wives tales. Read on to see if you've been tricked by a gardening myth. One Inch of Water Per Day – Many gardeners know that an inch of water a day is the rule of thumb. Unfortunately, this rule needs some serious revision. Not all plants require the same amount of water. For example, grass needs significantly less than a full grown oak tree yet more than your lettuce heads. Knowing how much water each plant requires will help you maintain a healthier garden and landscaped yard. 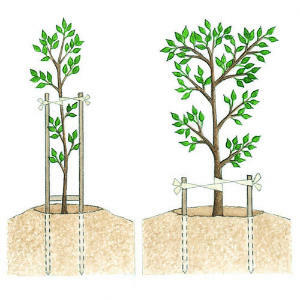 Stake Saplings – Staking young saplings has become common practice in the landscaping world. Although this helps the saplings to grow straight and tall, as well as protects them from rough weather, staking young saps can leave them susceptible to harm as adults. Staking saplings makes young trees dependent on added support and hinders deep, strong root development. If it is possible, leave your saplings unattended. Harsh weather and a stiff breeze will promote stable root develop. Watering in the Heat Burns Foliage – This myth could not be more false. Water droplets on leaves has never burned, nor never will burn, plant leaves on a hot summer day. The only reason why watering your plants in the heat of summer is undesirable is because of evaporation. When you water in the heat, less water makes it to the root system and you end up wasting water and money. If you already avoid watering in the heat of the afternoon, continue to do so. Just know that watering in the heat will not harm your plants.